Made of tough rotomoulded plastic, these robust travel/display carry cases come with wheels. They will travel safely under any mode of transport, be it in the back of a car or through air transport. They are the perfect one-case solution for a Nomadic Pop-up Display Stand. 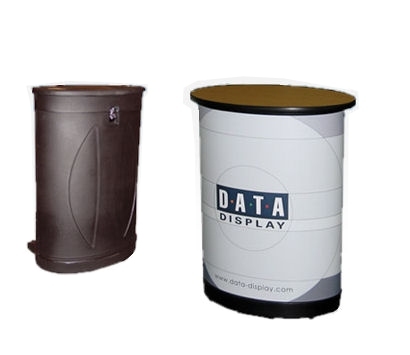 However they can also be used as a stand alone counter/display unit simply by adding a counter top and putting a printed/branded vinyl wrap around the case as seen in the pictures. Counter Tops are available in a number of different laminate colours.